A new initiative for the BEF in 2013, the Futurity Equine Bridge is an extension of the Futurity evaluations which have been running since 2005. 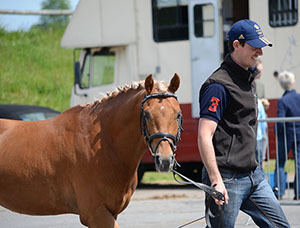 This new programme recognises that to have the best chances of reaching the age related levels required by the World Class Equine Pathway, the top Futurity graduates who are identified as having high potential, need support, assistance and direction from the very best coaches, judges and selectors in order to be able to reach these required level for further assessment. The aim of the Equine Bridge is to provide direction and support to the riders and width="810" bgcolor="#FFFFFF" bgcolor="#FFFFFF" of horses and ponies identified as having international potential and to help their owners and breeders realise the best of their horse/pony’s ability. For the 2013 pilot, horses and ponies which have previously participated in Futurity and obtained the threshold score of 8.5 have been invited and those that were entered as Sports Ponies are listed below. 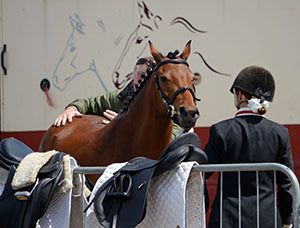 At the assessment days, ponies will undergo a veterinary assessment as well as a ridden one. Two assessment sessions will be run, one for dressage horses & ponies and the other for show jumpers & eventers. All assessments are being held at Solihull Riding Club, West Midlands and spectators are welcome. The dressage assessor is FEI Dressage Judge, rider & trainer Isobel Wessels; former international show jumper and top coach, Di Lampard is assessing the Show Jumping and the Eventing assessor is still to be confirmed. A total of 35 four & five year old ponies meet the minimum score of 8.5 for invitation to a 2013 selection day, and 29 of these are SPSS Registered (shown in bold red in the table below) and/or have a SPSS graded sire, dam and/or damsire (also shown in bold red). 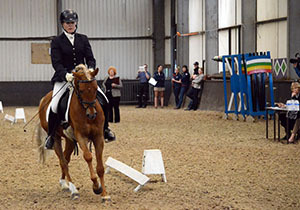 Where a pony has achieved more than one qualifying score for the 2013 Equine Bridge Selection Day, only the highest score is included in the list below. For the pilot only, if owners do not believe their four year olds are ready for assessment (or are injured) in spring 2013, they can request a deferral until Spring 2014. This does however mean that, if selected a year later, these ponies will only be able to benefit from one year on the Equine Bridge, instead of two. All assessment days are being held at the Solihull Riding Club, West Midlands and spectators are welcome. Note that, while all of the ponies listed below were entered as Sports Ponies in the Futurity Evaluations, they may now have gone over height and will need to be assessed as horses. Also, this list has been complied by the SPSS from the published Futurity results and may not be complete. 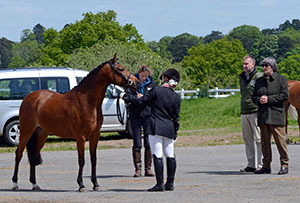 The first Equine Bridge Assessment day was for 5 year old dressage horses and ponies. It took place on the 2nd June at Solihull Riding Club, West Midlands. Twenty-one horses and ponies were scheduled to be seen on the day and they were viewed in small groups (generally 3 in each group). 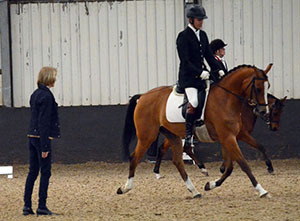 The assessors were Isobel Wessels (ridden section) and Jane Nixon (vetting phase). 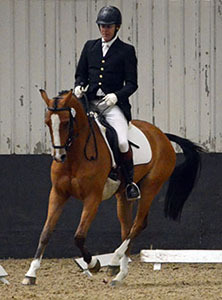 Isobel Wessels is an international (FEI 5*) dressage judge and rider. 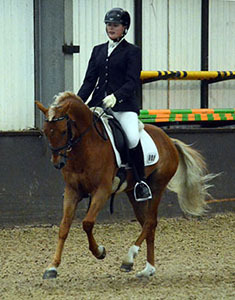 Isobel has regularly judged FEI Pony classes, including the 2010 Pony European Championships. Jane Nixon is well known as one of the regular Futurity vet assessors and she is also the BEF Director of Equine Development. The young horses/ponies came into the indoor school in their group and were given a few minutes to walk around and familiarise themselves with the 20x60 arena that was laid out within the school. Then they were directed through a simple dressage test as a group which comprised of trot 20m circles and lengthened strides on each rein, then canter (starting on a 20m circle) and lengthened strides. In both the trot and canter, the lengthened strides were shown along the long side to give the judge, sat at E, the best view. Next the group walked, halted and showed immobility, then had a free walk break. The test then concluded with a trot serpentine and a circle with the pony asked to stretch down before returning to free walk. After observing the commanded test, Isobel then asked for the ponies to be lined up and spoke to each rider in turn, out of earshot of the audience. After this, the ponies were worked in open order, with Isobel coaching from the centre to ensure that she saw the best possible performance form each of the ponies. Finally, Isobel asked each of the riders to dismount and remove the saddle so she could look at the pony's confirmation. Immediately after the ridden phase, the ponies were taken outside onto a partitioned off section of the car park and presented to the vet, Jane Nixon, in number order. After looking at the pony's confirmation, Jane asked each pony was asked to walk away and then back twice and then the same in trot. Next they were asked to trot in a large circle on a loose rein in both directions. Then, the ponies were backed up and then turned tightly both ways. Again out of earshot of spectators, Jane gave feedback to the pony's connections. The chartered physiotherapist Tim Bradford was also present and had input to the assessment/feedback. As well as the informal feedback on the day, all entrants are also given formal feedback when they are notified of the results by post. Abbeywoods Chocolate Brownie. Known as "Coco", this 13.3hh mare was awarded a Elite as a 3 year old. Bred by Mr S Wilson, Coco is by Copybush Chiron out of Harroway Pot of Gold (by Harroway Mr Harlequin) and she was bought, along with her dam, as a 5 month old foal by her current owner, Sarah Ablewhite. Sarah backed and brought on Coco herself despite having had a hip replacement and subsequent complications. As a result, Coco has had little competition experience to date, but did score 67% in her first dressage test and she also jumps. Kingswalk Moonraker. SPSS registered Moonraker is by the SPSS Elite international dressage pony Bernwode Brokat out of Kingswalk Sheer Havoc (by Chidock Fankino). This gelding was bred by Liane Payne and was awarded a High First Premium in the dressage section as a 2 year old. Moonraker was backed by Liane before being sold in 2012 to his current owner, Sarah Kellard-Smith. Sarah and her daughters are keen eventers, Moonraker is being produced for eventing as well as dressage and was hunted over the winter. As the one of Sarah's daughters was competing at the Brand Hall National Eventing Pony Championships which were on over the same weekend, Ian Wills kindly presented Moonraker for them. WFS Top Red. Known as "Junior", this young SPSS registered stallion graded with the SPSS in September 2012 and also won the Young Dressage Pony Championships the same year. Bred by Yvonne Wood and Sarah Steggall and carrying the prefix WFS for Yvonne's "Wood Family Stud", Junior is owned by Sarah Steggall and Elaine Coleridge Smith. Both Junior's sire, the SPSS Elite graded stallion Top Yellow and damsire, Pilgrims Red, are past German Bundeschampions and Top Yellow also competed Internationally at Dressage. Junior and his rider/trainer, Linsay White (nee Coleridge Smith) have qualified for the British Dressage Novice Open Summer Regional Championships. 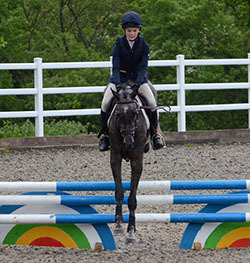 The second Equine Bridge Assessment day was for 5 year old eventing horses and ponies. It took place on the 13th June at Solihull Riding Club, West Midlands. Fourteen horses and ponies were scheduled to be seen on the day (including 2 four year olds) and they were viewed individually, with the ponies being assessed in exactly the same way as the horses. The assessors were Harry Payne (dressage section), Christie Wright (jumping section) and Jane Nixon (vetting phase). Harry is a FEI Eventing 3*/4* Judge, List 2A dressage judge and former eventer. 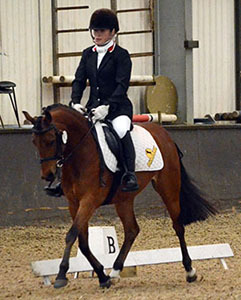 Christie is a BHSI, BE Accredited Coach and former 3/4* eventer. Jane is well known as one of the regular Futurity vet assessors and she is also the BEF Director of Equine Development. The young ponies came into the indoor school individually and, after a little time to familiarise themselves with the 20x60 arena that was laid out within the school, performed a short dressage test. The test was the same one used by for the Burghley Young Horse classes and included a 3 loop serpentine in trot, some trot lengthened strides (not for 4 year olds), canter 20m circles on both reins and both medium and free walk (on a long rein). After the set test was completed, Harry spoke to the rider, out of earshot of the audience, and then worked with them to ensure he saw the best possible performance form each of the ponies. The jumping assessment took place in the large outdoor arena. An area was sectioned off at the far end to allow the next pony/horse to warm up over a couple of jumps. There was sufficient time for front boots to be put on and the saddle swapped (if the riders wanted to). Each rider came forward in turn and, after Christie had spoken to them, they jumped the course of jumps, including a double. The course stared with 2 simple rustic fences, then included coloured poles and some fillers. The height of the course and the distance between the 2 elements of the double were adjusted to suit the ponies. On completion of the jumps, the riders were asked to gallop the full length of the arena. Then Christie spent some time coaching the rider including asking them to jump specific fences again. Finally, Christie asked each of the riders to dismount and remove the saddle so she could look at the pony's confirmation. This took pace immediately after the ridden phases and was run as it was for the Dressage Assessment Day (see report above). As well as the informal feedback from each of the assessors on the day, all entrants are also given formal feedback when they are notified of the results by post. Barum Peter Pan. This 4 year old pony (known as "Pete") is by Claire Howarth, his owner/breeder's WPCS Sec D, Cwmcae Comet Bach out of the British Riding Pony, Thimbleby Birthday Girl (by Courtway Arctic Gold). Pete was only backed in March this year and went to Anthony Clark 3 weeks before the assessment for more experience. Peter Pan was ridden by 13 year old Katie Horgan who also rode him in his first jumping competition at the beginning of June..
Cherryhills Arctic Kiss. Known as "Callie", this SPSS registered mare is by the SPSS Elite sire Laban (deceased) who is the sire of the 1998 Team Silver Medal winning pony, Red Alert. 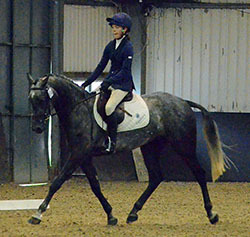 Callie's dam is a successful jumping pony, Paler Shade of Grey, who is believed to have come from Ireland and despite being just 13.1hh has successfully competed against horses in senior show jumping classes as well hunting and even (at age 21) being fast and clear round a 2'9" Hunter Trial. 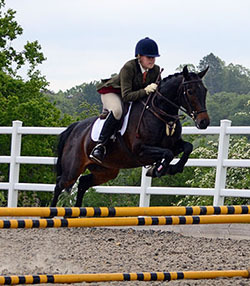 Callie was bred by her owner & rider, Hannah Owen, who has done all the backing and preparation herself. Hannah & Callie were 3rd in the 4 year old class at the 2012 SPSS Young Eventing Pony Championships. Diamond Black. This 5 year old small horse is SPSS Elite graded Sapphire Blue's second foal. Sapphire Blue, who is known at home as "Scruff" is by Shantamar (TB) out of Priceless Gem, a half Connemara mare (by Sooner Peace (TB)). Scruff was produced by her owner's daughter, Helen Bosanquet, and they won European Pony Eventing Team Bronze in 1996 when Helen was 15 and Scruff was 7. After an illustrious career with 3 other children, including two more Pony European Championships (2000 & 2001), Scruff returned to the Bosanquet family when she was 16 and started a second career as a broodmare by standing Mare Grading Champion at the 2005 SPSS Grading. Diamond Black is by the Polish bred TV, Stravinsky, who is approved for breeding by a number of warmblood stud books. 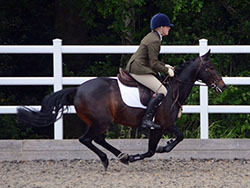 Diamond Black was ridden at the assessment by Helen Bosanquet and they completed their first BE90 class in May this year.